The Department of Marine Resources will decide whether to grant Mere Point Oyster Co. a 10-year, 40-acre lease expanding its oyster production on Maquoit Bay. BRUNSWICK — A contentious, emotionally charged hearing that stretched over three days since November wrapped up Tuesday, leaving the Department of Marine Resources to decide whether Mere Point Oyster Co. should be granted a 10-year, 40-acre lease too boost its oyster production on Maquoit Bay. If granted, Mere Point Oyster’s expansion would increase its operating space by nearly 160 times, increasing from roughly quarter-acre of Limited Purpose Aquaculture sites to 40 acres of professional oyster harvesting. The company’s annual harvest would increase from 60,000 last year to 1.5 million in the next three years, putting as many as 5 million oysters in the water at a given time.Two groups have vocally opposed this expansion — one, a group of about 19 commercial lobster fishermen, and the other a group of Brunswick residents, largely from Mere Point, known as the Maquoit Bay Preservation Group. The preservation group gave 26 minutes of testimony remaining at the start of the hearing, and many speakers expressed concern for the fishermen, who previously testified that the lease would infringe on valuable fishing grounds and result in a loss of revenue. Others, like Nicholas Rathbone, were bothered that owners Doug Niven and Dan Devereaux had chosen not put the lease site in front of their own homes and speculated that it was because they knew it would be loud, smelly and an eyesore. He questioned their decision to put it in the most densely populated part of the bay, the “worst possible” spot. Paul Dioli, another opponent, also called the location “crazy” and said he was concerned about the size and scope of what he sees as an unsustainable expansion. Recreation and commercial fishing would be negatively impacted, he argued, and even with Niven and Devereaux’s decision to designated 12 acres of the space as navigable corridors, it would only add travel time for people to get around and through them. Despite interruptions, arguments and numerous objections, several dozen people spoke during the public comment period. Many of the comments were contradictory, with lobstermen concerned over the loss of the area, and others who live and work on the water testifying that they did not often see lobster buoys within the proposed lease site. 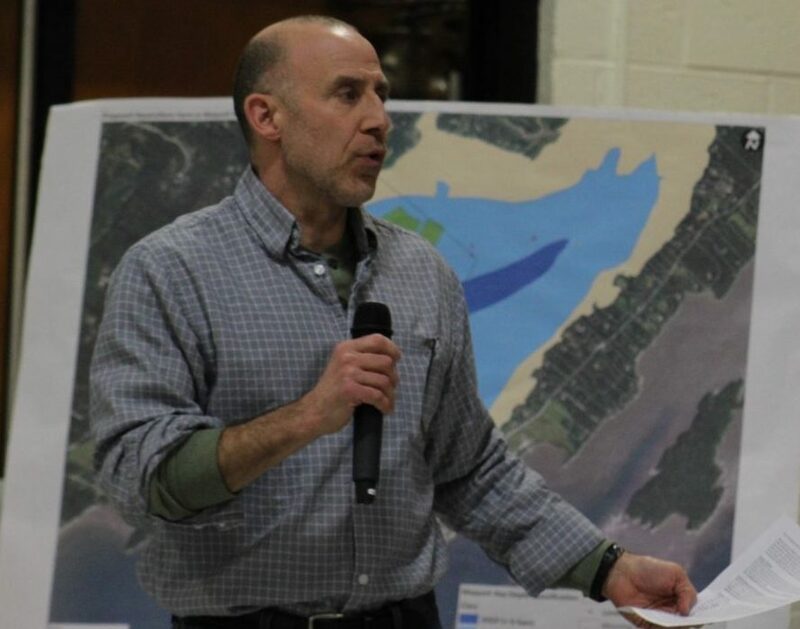 Concerns over the noise also came up, as Pat Rathbone raised worries that noise would scare off species like the Blue Heron and Langdon Winner and alleged that the application had “sketchy” descriptions of the company’s intended machinery and included insufficient estimates on how long loud machinery would be used. Others, however, expressed excitement over oysters’ restorative properties and their potential for improving water quality in Maquoit Bay. Brian O’Connor added that Maine, an aging state, needs new industry and people willing to take risks. “Change is hard,” he agreed, but as the site would occupy less than 2 percent of the bay for 10 years, they should be allowed to proceed — and ideally, as soon as possible, he said. Attorneys were asked to provide their closing arguments in writing for the sake of concluding the multi-day public hearing. The Department of Marine Resources has not yet given a timeline for when it expects to arrive at a decision.